College is stressful. Every student faces challenges; some of which are common among peers, and others that are more individual. LGBTQ students, for example, have a unique set of challenges to consider. Fortunately, more and more schools are working to make their campuses, traditional and online, more inclusive. 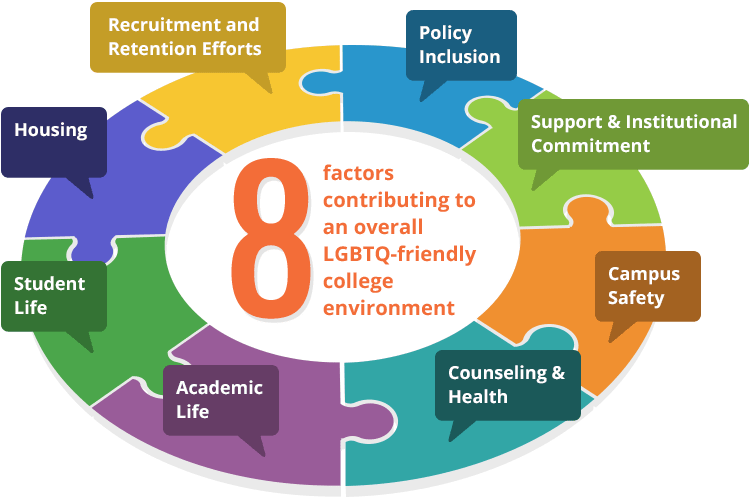 This guide takes a look at those colleges and universities leading the way in providing curricula and resources to support LGBTQ students throughout their college experience. Information on resources, curricula, and student organizations is provided, as well as candid interviews with LGBTQ community leaders to help alleviate some of the worries that LGBTQ students may have when it comes to postsecondary education. In an effort to provide LGBT students with the unique support and resources they need to be successful throughout college—and post graduation—many colleges and universities now have dedicated LGBT resource centers. These centers are a safe space where LGBT students can seek information, support, and culturally sensitive care. Many centers organize campus events and activities to help foster a strong sense of community, as well as promote awareness and wellness for all students, regardless of sexual orientation and/or gender identity and expression. There are currently nearly 200 colleges and universities in the United States with LGBT support centers or services. Source: Consortium of Higher Education LGBT Resource Professionals, Inc. Many schools offer online forums where students can connect with each other and discuss topics of current interest or issues within the LGBTQ community. These online discussion groups are confidential and allow members to participate whether they are out or not. LGBTQ students will tell you that well-informed and understanding instructors and other faculty and staff can mean the difference between success and failure in college. The most forward-thinking schools are aware of this and offer their employees orientation and training courses on subjects pertinent to its LGBTQ student population. Additionally, it is equally important to ensure a safe and accepting work environment for the school’s LGBTQ faculty and staff members. Providing comfortable and safe living accommodations for all students is a top priority for any college or university. For LGBTQ students, that often means housing options that are specifically designated and set aside for them. The forms that these housing options take are varied and can include everything from traditional individual or shared dormitory rooms to suite-style apartments to gender-neutral accommodations with open-style living environments. According to Campus Pride, there are currently 159 colleges and universities in the United States offering gender-inclusive housing (housing that allows students to have roommates of any gender). In addition, these special housing options are often extended to online students for overnight and short-term campus visits. Regardless of whether or not gender-inclusive or other special housing options are made available, under Title IX, colleges and universities with on-campus or campus-sponsored housing are prohibited from discriminating against individuals based on sexual orientation or gender identity, including transgender students. Events are often open to the general student population with many open to the surrounding community at large. For online LGBTQ students, these events provide a great opportunity to visit their campuses to network and have fun with their on-campus counterparts. Peer mentoring programs pair incoming students with LGBTQ faculty members or upperclassmen who can provide tremendous help with the often difficult adjustment to college life, whether on-campus or online. Mentors offer advice in a range of areas including academics and personal, social, and career goals. All eight factors receive an equal weight when determining a program’s overall score. To learn more about the index and review its findings, visit: www.campusprideindex.org. Possibly the best method of encouraging acceptance and promoting a safe learning environment on college campuses for LGBTQ students is through the development of LGBTQ-inclusive curricula. The reasoning is simple. Gay, lesbian, bisexual, and transgender individuals have made major contributions in science, industry and the arts and culture throughout history, but have rarely been acknowledged for their accomplishments. Adding that history to academic programs, along with lessons concerning current LGBTQ issues, engenders an atmosphere of acceptance and could also help LGBTQ students feel like they belong. The development of lesson plans in all fields of study that avoid bias and include positive representations of LBGTQ individuals, history, and current issues and events. The addition of degree programs (majors and minors), certificate programs, and individual courses covering subjects such as gender, sexuality, diversity, and queer history/culture. LGBTQ Studies, as you might expect, concerns the study of issues relating to gender identity, sexual orientation, and sexual identity, particularly in regard to individuals who identify as lesbian, gay, bisexual, transgender, queer, and questioning. LBGTQ Studies covers a lot of ground and includes the fields of history, philosophy, political science, biology, sociology, ethics, psychology, and many others. LGBTQ Studies can trace its origins back to the early 1970’s and a smattering of lesbian and gay studies programs at a small number of colleges and universities, including the University of California, Berkeley. The next few decades witnessed a slow but steady growth in degree and certificate programs with broadly defined subject titles such as Women’s Studies, Gender Studies, etc., offered mostly by more progressive-minded liberal arts colleges and universities. Today, LGBTQ-related degree and certificate programs are offered by dozens of colleges and universities, both public and private, throughout the nation. These programs take a number of forms including degrees with a LGBTQ Studies major, degrees with major titles such as Gender Studies, Cultural Studies and Human Sexuality with minor or emphasis options in LGBTQ Studies, and certificates with titles such as LGBT Health and LGBT-Affirmative Psychology. 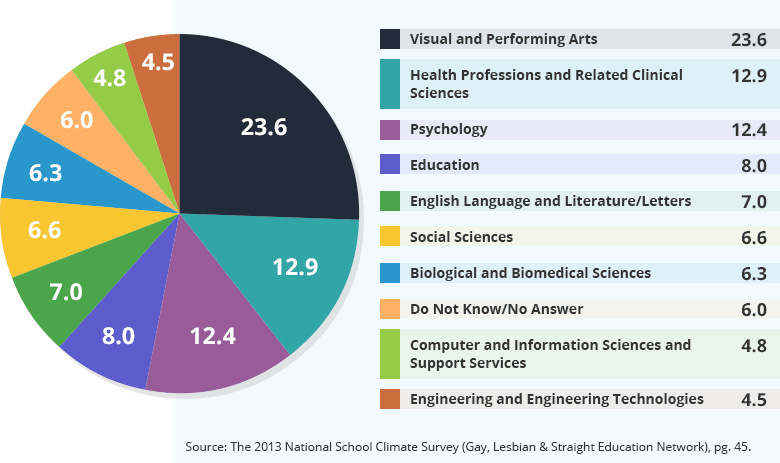 This is one of a very few number of bachelor degrees offered with a major in LGBT Studies, as most colleges with LGBT Studies programs offer only minors or concentrations in the subject. The B.A. in LGBT Studies is designed to advance knowledge in sexual and gender identity, and increase understanding of the diverse cultural, historic, ethnic, and contemporary experiences of people across sexualities. Upper division courses include Lesbian and Gay Identities in the Modern World, and Lesbian and Gay History and Culture. LGBT internships are available and provide opportunities to work in local public and private agencies serving LGBT populations and working toward LGBT equality. This bachelor’s degree program explores the ways in which gender–as it intersects with race, class ethnicity, sexuality, nationality and other differences–shapes and is shaped by social, economic, political, and other cultural forces and institutions. The LBGTQ Studies minor is designed to provide a comprehensive and interdisciplinary examination of the lives, experiences, and identities of LGBTQ individuals, their families and communities, cultures and subcultures, histories, institutions and more. A degree with this major/minor combination can be used in preparation for careers in fields such as law, social services, public policy, the arts, teaching and many others, as well as to prepare for graduate study in the social sciences or humanities. This master’s program offers graduate students a rigorous curriculum in the social science of sexuality with a strong focus on social theory and social research methods. The program does not provide for a specific emphasis in any particular subject, but students may elect to take any number of LGBTQ-related courses in the completion of the degree requirements. Course titles include: Perspectives in Gay, Lesbian, Bisexual, and Transgender Studies; Gay, Lesbian, and Bisexual History; Queer Art History; Introduction to Transgender Studies; and LGBT Sexuality and Health. Doctorate programs with the specific LGBTQ title are still non-existent at present. One leading Midwestern public university, however, offers a PhD in Gender Studies. This program explores the social processes, cultural representations, relations of power, and forms of knowledge that generate a range of gendered perspectives and experience. Core courses include: Concepts of Gender; Contemporary Debates in Feminist Theory; and Researching Gender Issues. Elective courses offered include: Cultural Politics and Twentieth Century Sexuality; Contested Masculinities; and Sexualized Genders/Gendered Sexualities. Probably the single biggest trend in postsecondary education over the last decade has been the explosion of online degrees offered by well-established and accredited colleges and universities throughout the United States. These schools are quickly recognizing the tremendous demand for quality online learning options among an ever-busier and employed student population. What has yet to be fully explored is the influence of online colleges on the LGBTQ student community. Many experts believe that the factors considered most important by prospective LGBTQ students in choosing an online program over a more traditional on-campus program are the same as the general student population, but there may be additional, more unique motivating factors. The following sections discuss the current online education environment and how it effects–and is affected by–the needs and preferences of LGBTQ students. Students, regardless of sexual orientation, choose to pursue online learning for a variety of personal reasons. Every student is different, each with his or her own specific requirements for college success. Below are a few examples of circumstances in which an online learning environment may be more ideal for an LGBTQ student. In this scenario, “geographically isolated” means a location prohibitively distant from an LGBTQ-friendly campus. Many LGBTQ students find that moving away from an isolated town to a more accepting urban setting can make a world of difference. There is no doubt that certain areas of the country are well known for being more progressive than others. Some students, however, may be unable to relocate to these areas due to financial limitations, family obligations, or a number of other personal reasons. For these students, finding a college or university with quality online education and an LGBTQ-inclusive reputation may be the next best option. For many students, the social aspect of college is as important as attending class. This is not necessarily a bad thing. Attending college on an established campus can be incredibly enriching. For some students, though, anything that takes away from their academic focus is to be avoided. Some LGBTQ students may feel pressure to become actively involved in on-campus political causes and social events when they just want to focus their energy on completing their degree. Online education allows those students to prioritize their studies and stay focused in a way that works best for them. Students may be limited to a small number of major options at their local college or university, particularly those in more rural areas. More specific to LGBTQ students, those options may be limited to schools with a less-than-welcoming environment or non-existent LGBTQ community. In such cases, an online degree program may provide the best solution, allowing class attendance and participation in an atmosphere where sexual orientation or gender identity will not be an issue. Larry D. Lariosa, MA, is a licensed marriage and family therapist, as well as the Diversity Program Manager and LGBT Specialist at the University of California San Francisco’s Office of Diversity and Outreach. In the following brief interview, Mr. Lariosa offers insight into online education and the LGBTQ community, along with some helpful advice for LGBTQ students considering an online college program. How has online education been helpful for the LGBTQ community? You know, I’m a therapist and I look at situations through the lens of what is best for a young adult’s mental health. I’m torn, really, because I think that a physical space is important; however, it is also important to be aware that areas of the US where homophobia and transphobia are a problem do not always have safe, physical spaces for LGBT youth. This is where online education can be helpful, I think, if the school is supportive. Socialization is so important—and if a student cannot socialize with peers who have similar needs/desires, they might be able to find a more supportive community online. Has online education created new challenges for the community? I’d say that lower income folks and homeless youth may be challenged by not having access to computers, but I don’t know if the actual online education itself is creating challenges. A challenge that does exist for many online and physical spaces is the persistence of very white, very Caucasian LGBT spaces. Embracing racial diversity and addressing the unique needs of youth of color will be important for both online and physical communities. Are online colleges doing enough to be supportive and inclusive? Some schools have established protections, anti-bullying measures, sure, but others haven’t caught up. I think the answer to that question lies in the resources that are being provided to students. For example, the University of California system has made a point to establish resource centers for LGBT students, staff and faculty–but no resource center is the same. There is also the question of, how do we reach out to students who are deeply in the closet? We want to be supportive and inclusive but if they are not ready to take advantage of the available resources [there’s not much we can do]. Any tips/recommendations for LGBT students looking for an online program? Look for supportive online communities and organizations. Social interaction is a necessary component of ensuring that LGBT students are happy and healthy. If a student is considering online learning, they should explore the virtual community—is there an online resource page? Is there a social media function that can connection the online LGBT student with their peers? Recognize your individual mental and social needs. Transgender students have different needs than bisexual, gay or lesbian students—and it is important to recognize this. Are there counseling resources available from this school? Does the school provide in-person counseling only, or is there a virtual counterpart? Take the time to research and explore the school you are considering. Recognize individual career needs as well. What trajectory do you want to take–and what is the school willing to do to help students along their career path? Being pragmatic about what is required to excel is crucial. Yes, it is important to take into account what the school can provide in terms of mental and social well-being, but don’t forget you are trying to educate yourself to prepare for a career. Don’t underestimate the importance of structure. With online learning–as opposed to on-campus learning–there may be less structure and a lot ends up in the hands of the student. Make a point to assess yourself and ask, is online learning right for my style?